Stucco is one of the most popular methods to finish the exterior of homes in the South and Southwest. It's extremely popular in the Atlanta area because of it's durability, weather resistance and it's vital part in the overall decor of Southern homes. The traditional application of stucco and lath occurs in three coats — the scratch coat, the brown coat and the finish coat. The two base coats of plaster are either hand-applied or machine sprayed. The finish coat can be troweled smooth, hand-textured, floated to a sand finish or sprayed.very year. 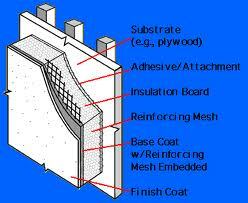 This stucco wall system is more commonly known as the EIFS system - Exterior Insulation Finishing System. This complete stucco wall system has been created for uniform and proper wall coverage, insulation and venting of the stucco to give it the longest life expectancy and to cut down on potential mold problems that were occurring in past installations. Before I became a professional home inspector I was a contractor/plasterer and worked hand in hand with stucco wall systems on nearly a daily basis. This gives me the advantage over other home inspectors who are new to the material. Moisture is a major problem with stucco and EIFS wall systems. Trapped moisture in the system can turn in to an absolute nightmare in new home construction as well as pre-owned homes. A moisture meter is the main tool used to determine problems within and behind the layers of a stucco wall and I use one one on every stucco inspection I perform. It gives me the ability to measure the moisture in different areas of the wall and more insight into the wall system as a hole. Stucco systems if not installed properly can become major problems in pre-owned homes as well as new construction. If your purchasing a home with Stucco or an EIFS system don't hesitate to have it inspected. It can save you thousands of dollars in the future and years of headaches.